German Unemployment Falls, While Employment Rises, But How Long Will It All Last? 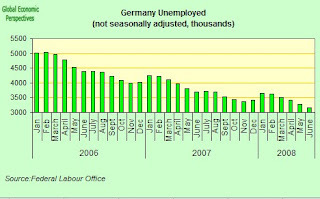 German unemployment declined in again in June, pushing the jobless rate to the lowest level in almost 16 years. 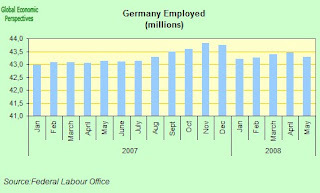 The number of people out of work, adjusted for seasonal changes, fell 38,000 from May to 3.27 million, according to data from the Nuremberg-based Federal Labor Agency released today. The seasonally adjusted unemployment rate declined to 7.8 percent from 7.9 percent in May, while the ILO comparable rate for May (released with one month's delay over the German methodology number) was stationary at 7.4%. In a separate data release the Federal Statistical Office reported that on the basis of preliminary calculations) there were 40.19 million people employed in May, an increase by 619,000 (or 1.6%) on May 2007. 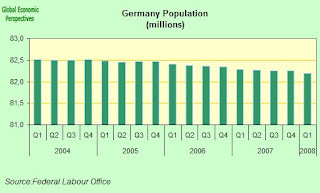 Compared with April 2008, the number of persons in employment was by 111,000 ( or 0.3%). Thus German job creation continued in May, although at a slightly slower pace than in previous months. From January to March this year, the number of persons in employment each month was by 1.8% higher than in the corresponding month of the previous year, while in April and May 2008 the increase had dropped slightly to 1.6% on April and May 2007. It is too early at this point to decide definitevely whether the current trend can be considered to mark a general slowdown on the labour market. At least part of the slowdown can probably be explained by the fact that the winter months had been unusually employment-friendly because of the mild weather, so that the usual upturn in spring was smaller, although of course this also means that growth in the earlier months of the year was not as stong as appears at first sight. When looking at the unemployment numbers it is also important to bear in mind that the German labour force is now near its historic peak, and will now steadily decline. An indication of this can be found in the chart below where it can be seen that the rapid growth in the population available for work which characterised the years between 1997 and 2005 has now come to an end, and since 2005 the numbers have been stagnating. 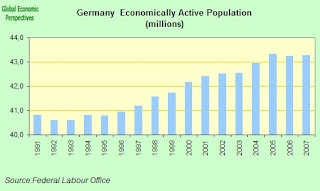 This stagnation in the potential labour force (before an eventual decline if immigration is not leveraged to facilitate growth) is also a reflection of the fact that Gernamy's population is now, slowly but steadly, declining, and has been declining since Q4 2004, as can be seen in the chart below. Nonetheless employment is rising for the time being, and unemployement falling, although many forward-looking indicators - such as the Ifo institute's business confidence index, and manufacturing orders are suggesting that German growth is set to slow. 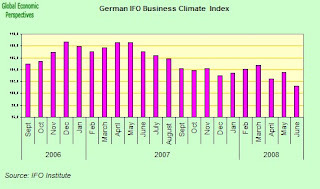 German business confidence fell to the lowest in more than two years in June, according to the reading on the Ifo index, which declined to 101.3 from 103.5 in May. That's the lowest since January 2006. The median of five forecasts published by economic institutes last month suggests the German economy will expand 2.2 percent this year before slowing to growth of 1 percent next. This may be rather optimistic, however, and the economy may in fact have shrunk in the second quarter after expanding 1.5 percent in the first three months, according to Deputy Economy Minister Walther Otremba. The flash purchasing managers index reading showed the employment component falling to 52.8 in June from 54.8 in May and 55.6 at the start of the year. A reading above 50 signals employment is still expanding. Among retailers, the measure fell to 49.8 in June from 51 in May, final retail PMI figures showed. Has Spain Contracted The Artemio Cruz Syndrome? The Mexican writer Carlos Fuentes once wrote a novel entitled "The Death of Artemio Cruz". The novel begins with an elderly Artemio who suddenly finds himself awake and lying on his deathbed, gripped by repeated spasms of excruciating pain, and terrified even to open his eyes for fear of what it is he might get to see if he does. After years of debauchery and loose living (shade's of Oscar Wilde's Dorian Gray here) the thing which seems to frighten him the most is the possibility he might get to take a look at himself in a mirror. Of course, there are comparisons and comparisons here. Spain's economy is far from moribund, nor is it in its death throes. But Spaniards are suffering, and the process of adjustment is painful, and the attitude of the country's leader - José Luis Rodriguez Zapatero - does somewhat resemble the case of Artemio Cruz in that he appears, at least from the outside, to be totally obsessed with looking at anything that isn't an actual reflection of the actual state of the Spanish economy. And of course it's easy to criticise here, since the problems Zapatero is reluctant to look too closely at are serious ones, and worse still, it isn't at all clear that anyone really knows what to do about them at this point. Well to get straight to the point, in good old basic Econ 101 direct fashion, at this moment in time everything about the Spanish economy is either going dramatically up, or coming dramatically down. On the upside we have consumer price inflation, producer prices, unemployment, unpaid bills of exchange, and the current account deficit. Going down fast we have retail sales, industrial output, services activity, bank lending, and of course mortgage lending and construction activity. Of course this is now a complete horror story, and in macro economic terms the problem is grim. But this unfortunately isn't the worst of it. It is all too apparent from the above graphs that the slowdown in the contruction sector has now spread, and extended across the "real economy" as a whole. 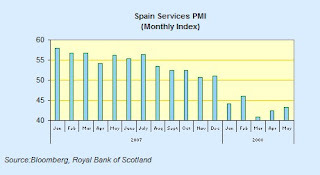 Maybe the worst of part of all this is the state of the services sector, which has long been the mainstay of the Spanish economic expansion, and which is now, at least according to the purchasing managers index, contracting very sharply, and has been doing so since January. But how did the problem start up in the construction sector? This is the real isue, since what sets the property slowdown in Spain (and of course in Ireland and the UK) apart from the normal, run of the mill, garden variety of property slowdown, is that it didn't start with an interest rate tightening process from the central bank (this was taking place, and a more or less orderly correction did seem to be underway) but rather it was given a huge kick from the credit crunch shock which effectively followed the outbreak of the US sub prime crisis in mid August 2007. In particular the Spanish banks found themselves in a major quandry when they discovered that the wholesale money markets had become effectively closed to their leading financial product (the cedula hipotecaria) after September. So this is a tale of two structural problems, one a bank financing one, and the other an external deficit one. Let's look at them one at a time. Evidence of the difficulties that Spain's banks are having is everywhere. Take bank lending for example. According to the most recent data we have from the Bank of Spain, lending to Spanish households was up by 4.245 billion euros in March when compared with February, and year on year lending to households was up by only 10.6%. 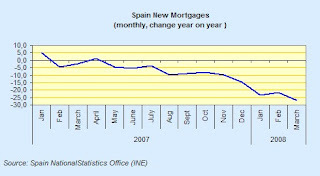 I say "only" here since this rate of increase in lending is only about half what it was at the start of 2007, and as such it is only about half the rate of new mortgage generation that the extensive Spanish construction industry needs simply to keep turning over. 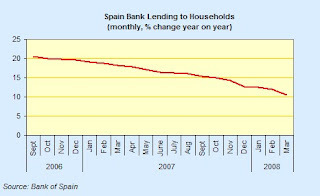 The reason for this decline in the rate of new lending creation is obvious: the liquidity crunch, which is now the principal reason why Spanish banks are steadily lending less and less extra money in new mortgages each month, although as seen above we are now steadily moving from a construction crisis fuelled by a lack of availability of funds for mortgages to one which will be increasingly driven by absence of demand for them as the "affordability" issue steadily locks-in on those who would like to buy their own home. The fundamental problem is not that hard to understand, even for the non specialist: since the Spanish banks are now short of cash they are simply able to lend less, and it is this, and not the 4% repo rate set by the ECB (or the sudden rise in 1 year Euribor following the sub prime shock), which is the principal reason the value of mortgages created on urban buildings in Spain (at approximately 16,575 million euros) was down in March 2008 by 36.7% over March 2007. In housing, the capital loaned exceeded 9,975 million euros, 41.9% less than in March 2007. 105,608 properties were mortgaged in March 2008, a decrease of 37.77% over March 2007. The Spanish banks are, of course, able to raise money, but much of this is on a short term basis, and not appropriate for long term lending on products such as mortgages. Moody's recently suggested that Spanish savings banks are trying to attract foreign investors (especially German pension and investment funds) with private placements of tailor-made securities. But such issues are typically in the 30 to 300 million euro range - a long way from the earlier jumbo cedulas. In addition maturity on these securities is much shorter, typically three years. Another strategy the banks have been using has been to issue short term (typically three month) paper, and there was roughly 90 billion euros worth of it outstanding at the end of March. Banks are also trying frantically to attract more deposits, and since the end of last year some 20 billion euros have been transferred out of investment funds into long term deposits. The however do not come cheap, and the price the banks are paying for this money is prohibitively expensive - some of it even pays 7% - for it to be used as a basis for mortgage finance, for mortgage finance since mortagages are still widely on offer for around 0.5% over 1 year euribor (or 5.25% or so). Thus the problem for the banks is really how to find a stable long term source of finance for their mortgage business given the fact that the wholesale money markets have been virtually closed in their faces. Since we have no idea at the present time at what level Spanish property prices will finally settle (and thus what the true market value of the mortgages pools which effectively back the cedulas actually is) then it would seem that the day the doors will once more open again (at least at prices the Spanish banks would be interested in) is far from being at hand. The Madrid based consultancy Analystas Financeros Internacionales (AFI) estimate that during 2007 Spanish banks were raising approximately 40% of their funding requirements outside Spain, as compared with only 15% in 2000-2001. 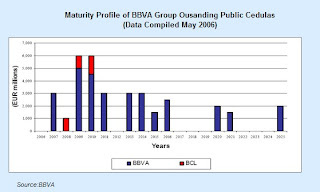 According to AFI the Spanish banks and savings banks did continue to issue residential mortgage backed securities (cedulas) in the second half of 2007 (to the tune of an estimated 50 billion euros, although this number seems rather high to me), but none of these were placed with external investors (since there were effectively no takers). Rather they were kept on the books for later use in repo facilities with the ECB as and when required. Data from the Bank of Spain show that Spanish banks have doubled their share of the ECB's weekly funding auctions since August 2007 - up to 10% of the total from a previous 5% - and that in February Spanish banks borrowed 44 billion euro out of a total of 442 billion euro borrowed by European banks. Which means the Spanish banks may have "parked" an additional 22 billion euros or so of cedulas with the ECB over this period, not an enormous quantity given the scale of the problem, and this suggests that at the present time they are resolving most of their immediate needs via other channels. "Of €208 billion ($320 billion) of eligible securities created, only about €5.8 billion have been placed with investors, according to calculations by JPMorgan." So some European banks have been increasingly creating paper for explicit use with the ECB. My feeling is that following all the publicity this issue has now been receiving the rate of new paper creation may well have diplomatically slowed, since if there is one thing Spanish banks don't like to do it is draw attention to themselves (unless of course the news is positive, which in this case it most decidedly isn't). Of course, if bad moves on to worse we may well see the need for more "containment" activity from the ECB. Which makes it rather unfortunate that so much liquidity has already been soaked up, before the show has truly gotten under way as it were. The big issue is of course that there is now no private market for the earlier jumbo bond offerings. Worse, many of the original jumbos were offered with maturities of between five and eight years. So these cedulas will effectively soon be coming up for rollover. 1/ the potential liquidity crisis which may be provoked by the need to refinance the cedulas. 2/ the potential increase in the quantity of bad debt provision which the Spanish banks may need to set aside as and when the builders themselves start going bankrupt in serious style. With anything up to an estimated 1 million unsold properties on the books in Spain at the moment, and with the banks being de facto owners of these properties through their financing of the builders, this avenue is the most important short term threat of debt delinquency, and not unpaid mortgages (IMHO). And the sums involved are by no means chickenfeed, and could well be very similar in magnitude to the quantities owing on the cedulas. ie the whole problem is very large indeed. Of course later, as the financial problem ripples its way through the real economy, the ability of individual households to meet their mortgage obligations may well become a problem, but we are a long way from that at this point, and sufficient unto the day is the evil thereof is very much the case here I think. AFI estimate that around 40 billion euros in cedulas and other bank debt come up for refinancing in the second half of 2008, that in 2009 this number will rise to around 80 billion euros, and that the number will remain high through 2010 and 2011. That is to say my rule of thumb guess that we may be facing around 300 billion euros in rollover issues (or somewhere in the region of 25% - 30% of Spanish annual GDP) in the coming years does not seem to be too far off the mark. And as I say, we may need to make similar provision for equivalent exposure to bankrupt builders etc. The following chart which is simply for the Spanish bank BBVA should give some rough and ready indication of the rollover issues which are coming up, and their temporal distribution. Spain had a current account deficit in March of 12,049.5 million euros, which was well up on the 7.3114 billion euros registered in March 2007. According to the Bank of Spain this deterioration in the current account is due to two factors, the increasing trade deficit, and a growing deficit in the income account. If we look at the trend in the current account deficit we will find that in the January to March period (Q1) the total deficit was 32.552 billion euros, while in Q1 2007 the total was 26.637 billion euros. This is a year on year increase of 26.3%. If we now consider the fact that last year's "whole year" deficit was an estimated 105.8 billion euros (or 10.1% of GDP) then if this first quarter trend continues Spain could well be facing a whole year deficit of something in the region of 130.8 billion euros. (The current IMF WEO guesstimate is 171 billion dollars, or at todays prices roughly 110 billion euros). Now, given that Spain also has a major economic (credit crunch driven) slowdown underway and that it is quite possible that GDP will be nearly stationary this year (let's say a maximum and very optimistic 1% whole year growth), the value of the the deficit as a % of GDP is set to rise, and possibly very substantially, by between 1 and 2 percentage points. In fact given that Spanish GDP at current prices in Q1 was some 268.496 billion euros, the CA deficit was already running at a rate of 12.12% of GDP. And to give us some idea that this way of doing things isn't entirely without foundation, we could note that the CA deficit during Q1 2007 was 24.89% of the whole year deficit. So where we go from here, it seems to me, depends on two things, the price of oil, and the rate of growth of the Spanish economy. To get some idea where we are here, it is perhaps worth mentioning that the goods trade deficit was up 4.5 billion euros in the January to March period over the same period in 2007 (or an increase of around 25% year on year), and since exports grew 2.4 billion euros while imports were up by 6.9 billion, then we can see that this story is virtually all about one thing: energy imports (since the rising income deficit - up 0.5 billion euros in Q1, or around 7.5% - while important for what it suggests about the future since Spain is having to borrow so much externally to keep afloat, is not determining over a short term horizon). In fact exports were down in March, but since March was such an untypical month due to the calendar effect of Easter I think we are better staying with the Q1 data for the time being. 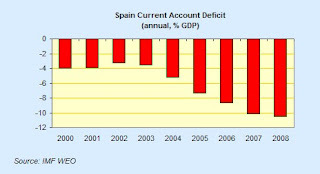 This large deficit in the Spanish current account - which resulted (after taking into account a small positive balance of 223 million euros in Spain's favour on the capital account) in a net financing requirement of 11.8 billion euros (up from 7.6 billion in March 2007) was basically covered by some very large movements on the financial account. Spain's net external financial balance with the rest of the world was running to the tune of 17.87 billion euros in March (up from 5.7 billion euros in March 2007). 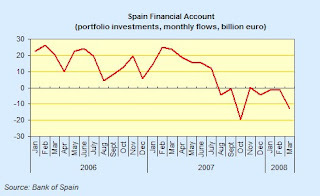 This increase in the inflow of external funds is very large indeed (and we will look in detail at some of the ingredients shortly), but the end result was that net assets of the Bank of Spain vis-a-vis the rest of the world were up by 6.86 billion euros on the month (a very large change from the negative balance of 773.9 million euros in March 2007). Now since things are going so stupendously badly as far as Spain's economy goes, we may well ask why things appear to be going so incredibly well on the flow of funds front. So let's take a look, since the answer we find may well be interesting. The large increase in the net flow of funds, was mainly the result of a significant increase in the category of "other investments" (which is basically made up by loans, deposits and repos) while there were net outflows on all the other instruments in the account. Direct investments saw an outflow of 2.3 billion euros, which was down on the net outflows of 6.27 billion euros in March 2007. There were net outlows to the tune of 14.34 billion euros in portfolio investments (largely bonds and equities) which contrasted with the large inflow under this concept 18.14 billion euros in March 2007. If we look at the appetite of foreign investors for Spainish bonds and equities the situation gets even worse, since in March there was disinvestment in Spain to the tune of 12.662 billion euros which compares with an inbound investment of 23.829 billion euros in March 2007. If we now come to repos, loans and deposits there were net inflows in March of 34.831 billion euros - while in March 2007 there were net outflows of 6.404billon euros. Now we don't have a monthly breakdown of this data, since the Bank of Spain gives this on a quarterly basis, and the last quarter we have is Q4 2007, but as a rough rule of thumb we could say that flows in and out of deposits at banks and other financial instutions are far and away the most important item here (about two thirds of the total, while repos are pretty insignificant at this level). The bottom line is that in March there was a massive disinvestment by Spanish financial institutions in deposits outside Spain - to the tune of 37.911 billone euros (bringing the money home?) which contrasts with net outflows in March 2007 of 18.846 billion euros. 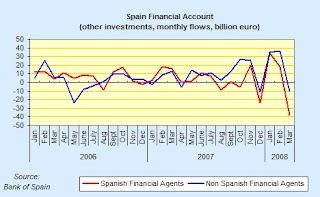 On the other hand foreign investors disinvested in Spanish loans and deposits by 3.080 billion euros which compares with inflows of 12.442 billlion euros in March 2007. Something happened in March, but I'm not really sure yet what, and we need to see more data. The above chart contrasts the respective flows by the two agents - internal and external - since essentially the balance doesn't tell you anything more than that it needs to be more or less maintained while it is who is moving what where which is really interesting (remember negative readings from Spanish agents mean positive inflows since they are disinvesting abroad). Looking at the chart we can see that lending and deposit transfers into Spain by external agents suddenly turned negative in March after two months of quite strong positive flows, and as a result Spanish financial institutions had themselves to transfer money into Spain, otherwise it seems to me the whole domestic liquidity situation would have been like it was in December (when something similar happened, but the banks didn't move sufficient resources in and bank lending growth came to a virtual dead stop). Essentially as I say we need to see what happens under this heading in the coming months, but the volatility that has crept into these flows, and which is evident at the right hand end of the chart, is fascinating, and obviously indicative of things we are yet to learn about. What is becoming most clear is just how rapidly Spanish financial agents need to react when external the appetite for lending to Spain slows. I think this may well be one of the clearest indicators we have of the impact of the current account deficit induced money drought. In this post I have focused on two aspects of Spain's current economic crisis, the growing current account funding problem and the structural financing problem in the banking sector. Of course, at the end of the day these problems both boil down to one: Spaniards need to start saving more and borrowing less for consumption. This is very easy to say, but will mean an enormous wrench and change in previous behavioural patterns. What I want to stress is that these factors are structural and not cyclical, and it would be fools gold to be playing around at this point in time with the idea that some sort of cyclical uptick will miraculously put things right. Since domestic demand is no longer going to drive the Spanish economy the undelying issue now is basically Spain's lack of competitiveness in exports, and its very strong external energy dependence at a time when oil prices are rising substantially, and when the high price effect looks like it could be long term. For some time the existence of this problem was hidden by the impact of the housing boom, and by the fact that this boom was increasingly financed by the issue of asset backed securities (ABS, cedulas hipotecarias). 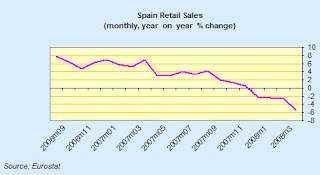 Thus during the boom Spain had no difficulty financing its deficit. But times have changed. My general impression is that even the funding that the Spanish banks are currently getting from the ECB is far from being sufficient since it covers only a small part of their needs and hence bank lending is rising at around 5% per annum instead of the 20% year on year rises we were seeing a year ago. So the Spanish banks are really getting starved of cash (or cash at a price which is interesting to them for mortgage lending), and hence all the frantic tooing and frowing we are seeing on the financial account. Nowhere is this situation more clearly illustrated than in the case of the portfolio investment flows into Spain from foreign investors (basically bonds and equities), and as can be seen in the chart below these underwent a sea change following August last year. This is what explains all the frantic moving around looking for funds we are seeing, since without the under other concepts Spain could soon become seriously short of money. At the end of the day, if you are sending money out every month to pay for your oil, where are you going to get the funds from for new lending? Desperate situations require desparate acts. In my opinion the most serious property related issues here in Europe are to be found in Spain, Ireland and the UK. And Spain may well be in the worst state of the three of them due to the dependence on cedulas, and due to the fact that the term-mismatch issue means these need to be rolled-over in an none too distant future - starting with maybe 40 billion euros as early as this autumn. So the Spanish banks have to both refinance old lending and find the new money for future mortgages at one and the same time. Not funny. But, as we have seen here, on top of the credit-crunch property issues Spain also has a huge CA deficit one, and the problem is only likely to get bigger if oil prices keep rising. Spain shares this CA problem with Greece (deficit 2007 13.9% GDP) and Portugal (deficit 2007 9.4% GDP) within the eurozone and these deficits have largely been masked by serving up "all eurozone" data where the large German surplus (surplus 2007 7.6% GDP) covers a multitude of sins. But German citizens are obviously NOT going to pay for Spanish oil (they may lend the money, but how long can this can continue to go up and up is anyones guess, it looks like an extermely exaggerated version of the US funding depence on Japan and China in some strange sort of way). So the bottom line is that Spain is headed straight towards a crash on the two biggest global issues of the moment, the credit crunch and oil. The proverbial double whammy. 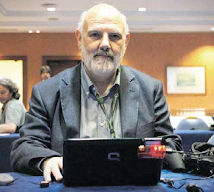 Not pretty, which perhaps explains why the average Spanish citizen, just like Artemio Cruz, prefers to keep his or her eyes closed rather than gaze on what might be there to behold with the eyes wide open and a mirror held up to their face.